1.Mix the rice powder, salt in a big vessel.Add water little by little and mix together.The mixture should be moist still crumbly.Keep aside for about 10 mins.To check if the water is enough,make the mixture to a ball, then it should be able to hold that shape and when you break it should be crumble again. There should not be any lumps in the mixture, if there, either break small lumps with hand or just pulse it in a mixer(which I have never done). 2. Now to make puttu you need a puttu kutti/kudam(Puttu maker).There are two forms of these,one only the kutti and another with a kudam.The earlier one is attached to the pressure cooker. The kudam/pressure cooker is first filled with water to half. allow the water to boil. Then the kutti is filled and kept on that through which the steam passes which cooks the puttu. 3. To fill puttu in kutti, layer the puttu kutti/mould first with 2 tbsp of coconut.Then put about 4 tbsp of rice mixture ,continue this by alternating coconut and rice mixture with coconut on top and close the lid. 4. Steam this by placing on puttu kudam or pressure cooker for about 7 to 8 mins.You can see high steam coming out of the puttu lid after 2 to 3 mins. 5. Then remove the puttu from the puttu kutti and serve warm with stew/kadala curry. 1. Wash and soak the rice in water for min 3 hours. 2. Drain the water using a strainer.Spread this rice on a paper to dry. When it is dry grind it to fine powder. 3. Heat this powder till slight smell of the fried powder comes(about 5 to 6 mins).Stir through out the process. There is high chance of the powder getting burnt at bottom as well as over frying the rice powder will result in a disaster while making puttu. 4. Cool the powder and use it to make puttu. So many puttu recipe offlate. I love putt and my favorite side side for that is pacha payaru curry. Yours looks so good. This is my most favourite, I love this combo and nice pictures. Just had Puttu and Kadala but your pictures making me hungry again.Recipe so well written and beautiful pictures.Thank you dear for another wonderful entry. Wat a traditional food,looks prefect.. 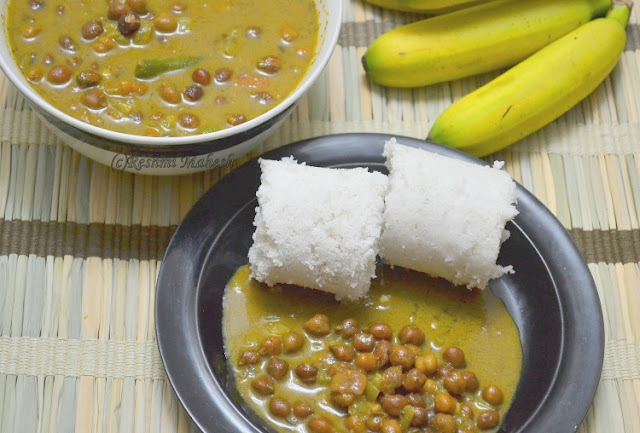 I am a greatttt admirer of puttu.But i never tasted it with channa.Hope i will taste it soon.Ur clicks are excellent. puttu looks so soft...i have never prepared the puttu mavu...amma always do that for me...but it will taste better if done with fresh mavu. Delicious combo !! looks yummy !! 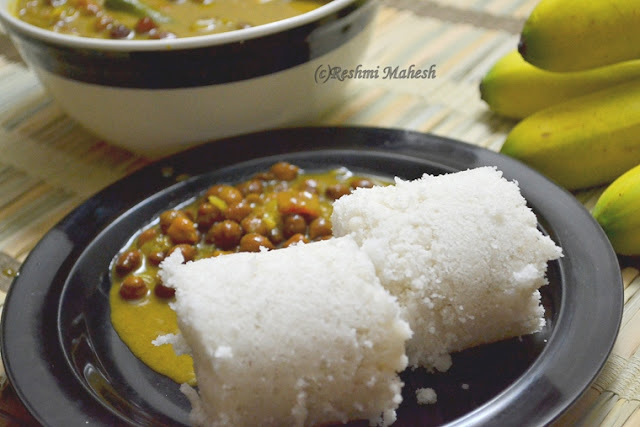 one of my fave breakfast combo...nice pics..
reshmi.. yummy puttu and kadala curry! reminds me of home..
About baby spitting food: I faced it for a while, got so frustrated, i can totally understand your situation.. i have a post about it.'http://ammaandbaby.blogspot.com/2010/12/picky-eaters.html'. but let me tell you it was really difficult to feed him those days. Lets hope its just a matter of time, they will eat only if they want to. But, when hungry he will come to you. Hope my blog helps. This is one dish I've been wanting to try. Has come out perfectly. You've tempting me with my favorite breakfast combo, and that too when I'm fasting...! Pics valare nannavunnudutto. Keep them coming. Hey I'm so glad that you tried a variations with the cookies and liked it--thanks a ton for the feedback. You are a sweetheart. Hugs! Nice pics and good step by step explanation! One of the most healthy and yummy Kerala breakfast.Puttu and kadala looks yumm . Mouth-watering clicks Reshmi..Ethu kandappozha orthathu, puttu undakkiyittu kure naal aayenne..Ethayalum superb aayittundu..
looks nice & lovely clicks ! love this combo...and the presentation is fabulous...!! !